Let’s face it! Grabbing a workout can be the BIGGEST CHORE in your daily routine. Not only do you sit and contemplate on whether or not to go to the gym, but also as you contemplate and idly waiting, you are feeling stagnant, unproductive and most of all LAZY! We all struggle with trying to keep working out from being mundane and boring. Statistics show that if one can get 30 minutes or more of moderate-intensity exercise per day at least 5 days a week, one can improve the quality of their life and reduce the risks of developing coronary heart disease, hypertension, some cancers and type 2 diabetes. Also, any cardio related workout can burn some serious calories. There are so many cardio fitness classes out there on the market such as ZUMBA FITNESS, LATIN JAM WORKOUT, U-JAM FITNESS, DANCE IT OUT and many others that I could name, but it would take up the whole purpose of why I’m writing this blog. Now, before you look at the above-said exercises that I named and whine, “I’m not coordinated!” or “I have two left feet!” or “I can’t dance!” Allow me to provide for you a perfect solution for you to get your cardio groove on as well as burning off the poundage and not look like Jim Carrey while doing it: A Glow Party Workout! At Heartbeat House Dance Studio (located in Atwater Village), this studio has monthly cardio glow parties guaranteed to make you sweat all the while having fun. Yes, folks! This type of workout is getting some serious attention in a lot of dance studios and gyms all around the country. If you haven’t experienced working out underneath black lights and glow sticks, then you are missing out! No more wondering what you look like in the mirror while you are getting your workout groove on or being self-conscious about getting the moves exactly correct or bright fluorescent, clinical lighting. It’s just YOU, the MUSIC, a BLACK LIT DARK ROOM and a lot of crazy colors floating around in the dark. It’s like being at a rave except the infectious groove of the music is your high. It definitely changes the level of your workout experience as you burn some SERIOUS calories (between 600 and 1,000+). What makes this fun is that anyone can do this both young and old. It does make the usual mundane workout an exhilarating experience. 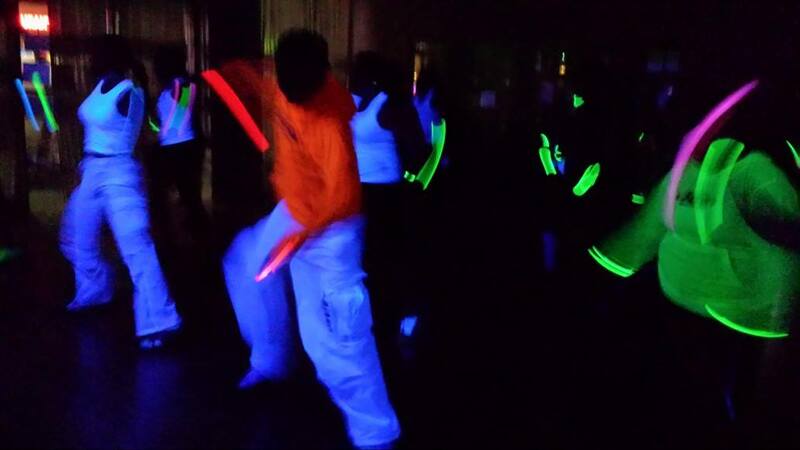 Latin Jam Workout founder, JP Santana, hosts monthly glow parties around Southern California for students who want to get their workout groove on. Who cares what you look like in the dark shakin’ what your momma gave you? You are there to get your calorie burn on and get your doctor recommended dose of exercise. There are many happening around your town at your nearby local dance studio or gym. WARNING: Once you get a taste of what a glow party could be like, you will become ADDICTED!! !